Europe experienced a long period of dry and hot weather in spring and summer 2018. Many parts of western, northern and central Europe were exposed to record-breaking heat, severe droughts and extensive wildfires. The north of Europe was exceptionally warm and dry from May till July. European heat wave reached its climax in early August with air temperatures rising up to nearly 47°C in the southern half of Portugal and southwest Spain. 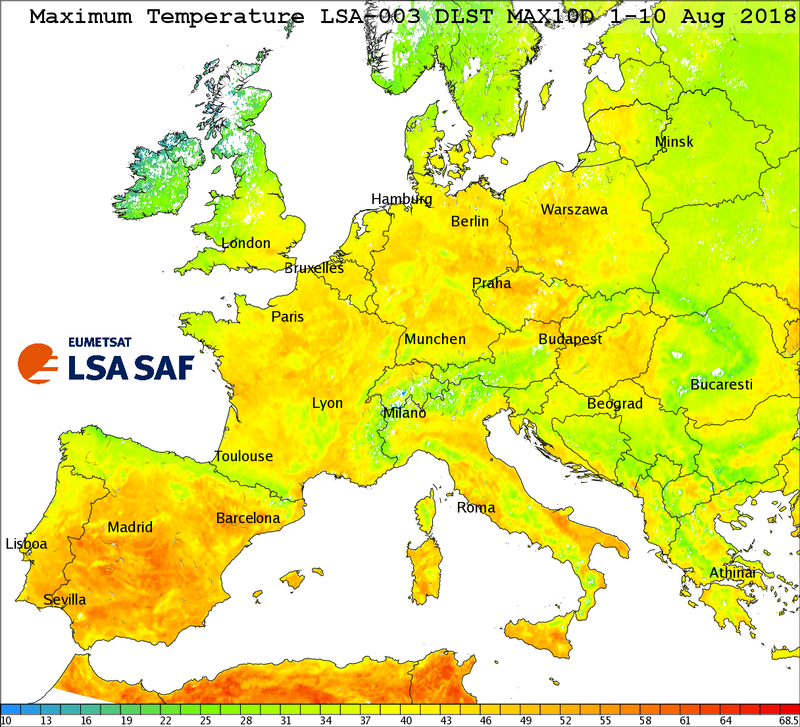 LSA SAF Derived Land Surface Temperature (DLST; LSA-003) product is particularly convenient for a summary of weather conditions in the first 10-day period of August. DLST provides the synthesis of daily cycle, which is captured by 15-minute LSA SAF Land Surface Temperature (LST; LSA-001), over 10-day periods. 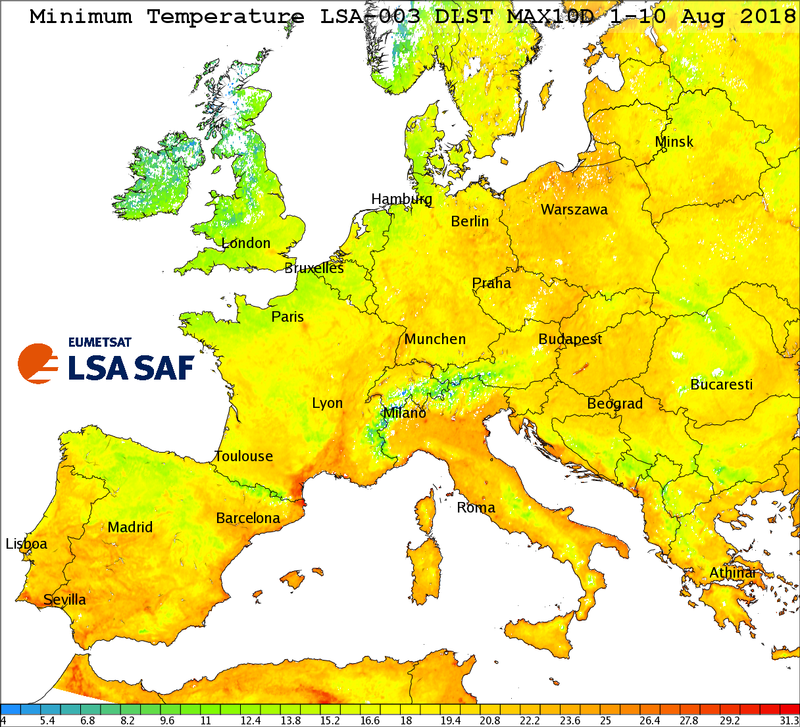 DLST daily high temperatures highlight parts of Europe where the heat wave was at its strongest. In addition to Iberia, especially France, Italy and Germany experienced very high temperatures in early August (see figure displaying maximum temperature over Europe). The figure displaying minimum temperature over Europe indicates summer urban heat islands for several European cities (London, Paris, Toulouse, Madrid, Milano, Rome, ...) and a large high temperature area at the French Mediterranean coast. The hottest day of the heat wave was 4 August 2018. Numerous ground monitoring stations in Portugal reported record-breaking measurements of air temperature on that day. To study the intensity and spatial extent of the heat wave over Iberia for this particular day, maximum daily values of LST were calculated. 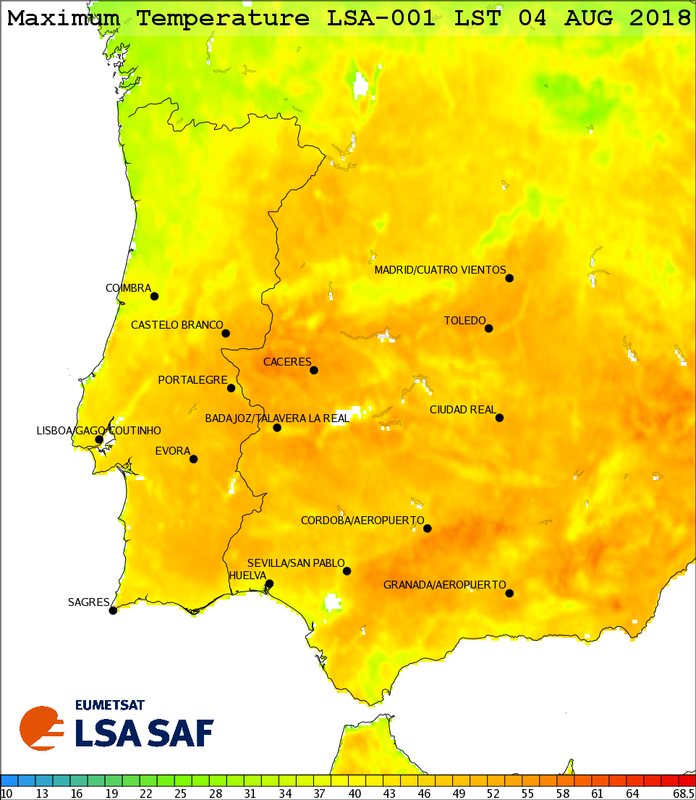 From the figure showing maximum temperature over Iberia, one is able to observe regions with the highest land surface temperature and notice the difference between the very hot south Iberia and the less hot north of the peninsula. The figure also displays a few locations where in-situ measurements of air temperature were record-breaking or very high. However, the regions with very high maximum LST do not always match the areas with the highest in-situ measured air temperature. LST is also affected by various factors, e.g., soil moisture content, vegetation cover, surface cover type, texture and roughness.